I won't pretend for a minute that this year's election is important, but let's face it...every now and then, we need a minute to take our minds off interpreting political banter and think about something else. Like...exercise! Okay, maybe not. How about vacation instead? As it happens, there's a new guy who's running. His name? Captain Obvious. And how, you may ask, is he running? With his feet, #obviously. He's literally running across America! He's taking the presidential race by storm and stopping by each state as he is running. Along the way, he's tweeting about the race and sharing pieces of humor to lighten the mood as the actual presidential election draws near. Follow along at @CaptainObvious for live tweets of presidential events and more. I don't know about you, but when I exercise, I am done by the time the day ends and it's time to sleep. Captain Obvious feels this way too, because he's gotten Hotels.com on his side for the race. In all fifty states, they're finding him running shoes, socks, shorts, and most importantly - a place to rest his weary head. And his exceptionally weary legs. When you're exhausted from traveling, what's most important to you in a hotel? I personally am happy just as long as the room is dark and quiet. 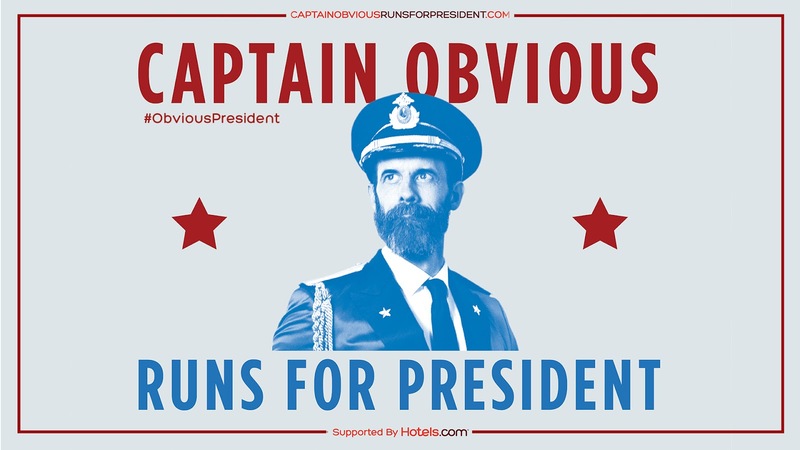 Follow Captain Obvious as he runs at CaptainObviousRunsForPresident.com! What does he have to say about your state?